Recently I was tasked with setting up Dial-in conferencing in Skype for Business using a Shoretel voip system and the PSTN Gateway. Seems simple, until you do some digging and find out that Shoretel 14 doesn’t support SIP over TCP, and S4B doesn’t support SIP over UDP. I looked at the recommended option from Shoretel, which is a Mediant Session Border Controller to proxy between the two voip systems. I’m sure that would work fine if money was no object, but when the budget for the project is minimal, another option is required. The option I settled on was an open source PBX platform in the form of FreePBX, which is essentially a gui for Asterisk. After a lot of research, posts with missing information and trial and error I finally got the solution working by following multiple guides for various products connecting to other products until I finally found a configuration that worked. The solution has been in place for roughly a month now and seen a reasonable amount of load while remaining stable. We haven’t had any call quality issues over PSTN either. I should point out here though that this particular installation wasn’t configured to support enterprise voice and user extensions would still remain in Shoretel. If User Extensions on Skype is your end game, then maybe this solution isn’t for you. Feel free to follow along though. Disclaimer: Some of the configuration detailed in this post is quite advanced and shouldn’t be attempted on a live system unless you are confident you know what you are doing. I am not responsible for any damage you cause to your own systems. The settings in this post are the settings used in our setup and work for us. The settings required for your setup may differ. The version numbers of the components used are as follows. To start with I followed a guide on PowerPBX to get Asterisk installed on Ubuntu Server. I’d recommend doing the same if you don’t already have a FreePBX installation or are as new to FreePBX as I am. Some of the settings later in this post may conflict with settings currently in use if you already have a FreePBX installation that you intend to use. Navigate to Platform Hardware > Voice switches > Primary. Click the name of the switch you want to allocate the SIP Trunks on. Change one (or more) of the ports to 5 SIP Trunks. Next you need to configure a Trunk Group on the Shoretel system. To do this you need to navigate to Trunks > Trunk Groups. Select the site that contains your switch with the SIP trunk port(s) configured and select SIP from the Type drop down before clicking Go. I’ll list the settings used by our setup below. You may need to tweak these for your own deployment. 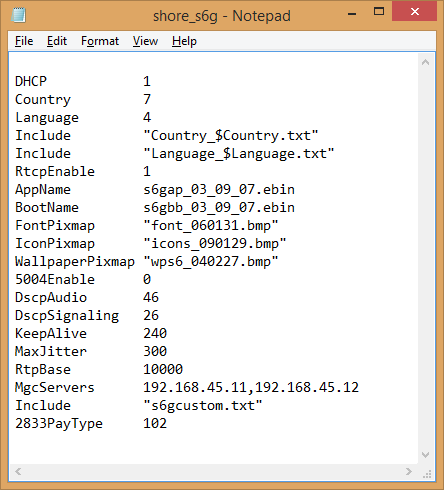 Name – Skype for Business. Enable SIP Info for G.711 DTMF Signalling – Unchecked. Profile – Default Tie Trunk. Username – siptrunkusername (Not my actual username). Password – siptrunkpassword (Not my actual password). Number of Digits from CO – 4. Local Area Code – 1670 (Yours will be different). Billing Telephone Number – Blank. Navigate to Trunks > Individual Trunks. Select the same site as the Trunk Group you have just created, and then select the Trunk Group from the drop down menu, followed by Go. Enter a Name for the trunks. Shoretel will increment the name with numbers if there is more than one individual trunk. Select the switch to use for the SIP trunks. This will be the switch you configured earlier. Enter the number of individual trunks you want in the group. A trunk is required for each phone call or participant of a conference. Don’t exceed your licensed amount of SIP Trunks unless you know how the licensing on Shoretel works.. Enter the IP address of your Free PBX server. Now for the FreePBX configuration. Providing you followed the guide mentioned earlier, and didn’t have any problems, you should have a working FreePBX server installed and running. You will need to tweak some of the system SIP settings to make this solution work. Navigate to Settings > Advanced Settings. Scroll down to the Dialplan and Operations section. Set SIP Channel Driver to chan_sip. Navigate to Settings > Asterisk SIP Settings. Set Allow Anonymous Inbound SIP Calls to Yes. Enter your internal networks. For Example 192.168.1.0 / 24. Click Submit (bottom) followed by Apply Config. Click Chan SIP at the top right of the page. Set IP Configuration to Static IP. Set Override External IP to the IP address of your FreePBX server. Click Submit Changes followed by Apply Config. Once the server has rebooted ensure you can log back in to FreePBX and that you have no errors displayed on the home page. If everything is OK, then it is time to create the Trunks on the FreePBX end. Navigate to Connectivity > Trunks. Click Add SIP (chan_sip) Trunk. Enter a name for the Trunk. Ours is simply Shoretel. Set Maximum Channel to the number of individual trunks you created in Shoretel earlier. In the top Dialed Number Manipulation Rules row add a dot (.) in the match pattern field. In the Outgoing Settings section specify the Trunk Name Again. In the PEER Details section you need to add the following information, substituting anything in () for your details setup earlier. I’d recommend pasting the text into notepad to edit it. Now, hopefully, if you navigate back to Reports > System Status you should see the graph line for Trunk Reg has increased to 1 from 0. 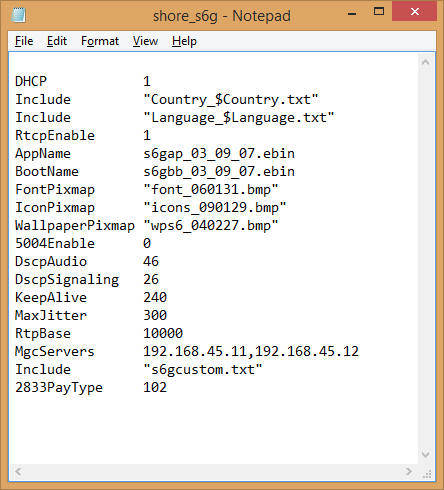 Next you need to create the trunk in FreePBX that connect to Skype for Business. The steps are similar to the steps for the Shoretel trunk with a few tweaked settings. Enter a name for the Trunk. Ours is simply Skype. In the top Dialed Number Manipulation Rules row add a pattern that matches your Off-System Extension range added in Shoretel earlier in the match pattern field. Ours is set to 85XX which will match any four digit extension starting with 85. Now you will need to make a topology change to your Skype for Business installation. You probably have some form of change control in place for these kind of changes so go and grab the required signatures and head back here. Expand Skype For Business > Site Name > Skype for Business Server 2015 > Mediation Pools. Right-Click the mediation pool you want to use and click Edit Properties. Ensure Enable TCP Port is Checked. Set TLS: to 5067 – 5067. Set TCP: to 5060 – 5060. Expand Skype For Business > Site Name > Shared Components and select PSTN Gateways. Right-Click the Container and select New IP/PSTN Gateway. For FQDN enter the IP address of your FreePBX server, then click Next. Click Next unless you need to change any settings for your environment. Set Trunk Name to FreePBX. Set Listening Port to 5067. Set SIP Transport Protocol to TLS. Select the Skype pool you want to associate as the Mediate Server. Set Associated Mediation Server Port to 5067. Expand Skype For Business > Site Name > Shared Components and select Trunks. Right-Click the Container and select New Trunk. Select your PSTN Gateway from the drop down menu. Set Listening port for IP/PSTN gateway to 5061. Set SIP Transport Protocol to TCP. Select your Associated Mediation Server to the pool you want to use. Set Associated Mediation Server port to 5060. Now you need to publish your topology in order to make the changes. I’ll leave that part up to you again incase you cause undesirable downtime or break something. In theory, your trunks should come up shortly after the topology is published. You can check this from the home page of the FreePBX administration portal by checking the graph line for Trunk Rag has increased from 1 to 2. For the next part of the configuration you will need access to the Skype For Business Admin portal. Specifically the Voice Routing and Conferencing sections. All of the steps in this section were performed on a Skype installation with no previous voice configuration. If your system already uses voice features I’d recommend leaving this bit to somebody that knows what they are doing if you don’t already. Navigate to Voice Routing > Voice Policy. Check all check boxes in the Calling Features section. Under Associated PSTN Usages section click New. Set Name to Shoretel and click OK.
Set Call forwarding and simultaneous ringing PSTN usages to Route using the call PSTN Usages. Type a Name of your choice. We chose Shoretel. Type . * (DotAsterisk) into the Match this pattern field. Click Shoretel Followed by OK.
Click Commit > Commit All. Navigate to Voice Routing > Trunk Configuration. Ensure Encryption support level is set to Optional. Click Shoretel and click OK.
Navigate to Voice Routing > Dial Plan. Specify a Dial-In Conferencing Region. We chose UK since that is where we are. Chose an External access prefix if you desire. We went with 9. In the Associated Normalization Rules section click new. Specify a Name of your choice. Remove any other normalization rules. Now click Commit > Commit all. While you are still in Skype you may as well configure the dial-in conferencing number. It won’t work yet but by doing so you will at least get some audible feedback to use to test your configuration while you complete the FreePBX and Shoretel routing later. Navigate to Conferencing > Dial-In Access Number. Enter the Display number as a the DDI you plan to use for your dial-in conferencing number for external parties. e.g. +441618444444. Add a Display name of your choice. in Line URI add tel:#### to represent the extension you want to use. In our case it reads tel:8500. In SIP URI add the sip address you want to assign. we went with sip:conferencing @ sipdomain.com. Select the Primary Language for this particular number. Select the region created in the dial plan and click OK.
Don’t forget your users will need to be allowed to use Dial-In conferencing in the conferencing policy applied to them. Now you need to head on over to the FreePBX admin portal again to create some routes. This is another part that caused a lot of confusion when I was initially trying to get this to work thanks to some other guides not being accurate. Again the settings here may differ slightly depending on your setup. The easiest way I found to route all calls through the Shoretel trunk unless they were specifically for an extension I knew existed in Skype. First of all I created the Incoming route to catch the calls for Skype. Navigate to Connectivity > Inbound Routes. Click Add Incoming Route in the top right of the page. You should also be able to start a Skype Meeting using the meet now feature in Skype and add a recipient by typing in their extension or telephone number and hitting enter. Navigate to Trunks > Trunk Groups. Select the trunk group that carries the DDI you wish to use. This was one of our ISDN groups. In the Received Digits field, enter the DDI in local format, ie excluding the country code and area code. In the next field add a name for the map. We went with Skype conferencing. Next select the Off System radio button and select the range you created in your SIP Trunk Group Extensions earlier. In the next field type the extension number used by Skype. 8500 in our case. Leave the Music on Hold as default. Click Add this record to the left of the row you have just filled in. At this point you should be able to dial the DDI you have just configured from a mobile phone and hear the same audio prompt from the Skype auto attendant. No doubt this post was a little tedious to follow. Unfortunately there isn’t a technique I’m aware of to make SIP an interesting subject. I do hope it might have helped somebody though at the end of the day. Or prevented any premature hair loss. Recently we started looking for an alternative method to distribute our analogue lines between our on-site buildings other than pulling fifty pair analogues under ground to our central building where our SG90’s are located. We found the solution in a product from Media 5 called a MediaTrix. The MediaTrix units are a 19″ rack-mount unit that is available in a 4-port, 8-port, 16-port and 24-port version, although the 24-port version required 2u of rack space. They connect to your network through a 10/100 RJ45 ethernet port (the newer models have 2) and present the analogue lines on RJ11 ports on the front of the unit. Each port can be configured to connect to an IP based PBX using the SIP protocol and can be authenticated individually, which is how we have the units configured. The units, although a great device, do have some minor bugs in the administration interfaces which, if unknown, can cause problems during configuration. Hopefully this post will help somebody configure a MediaTrix on a Shoretel telephone system. To start with you need to install the management software (Unit Management Network) which may have been included on a CD with your MediaTrix. If not it can be downloaded from the Media 5 support site. Once installed you need to plug the unit into your network and power it up. We will find the unit using the UMN utility. Once it is powered up open the UMN Client and click the find unit icon on the toolbar (second from left). This will open up the following dialogue box. 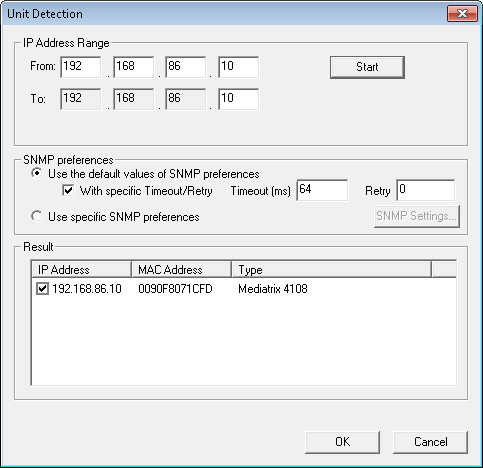 Insert the IP range of your network and click start. The utility will find the unit and list it in the box at the bottom of the dialogue. 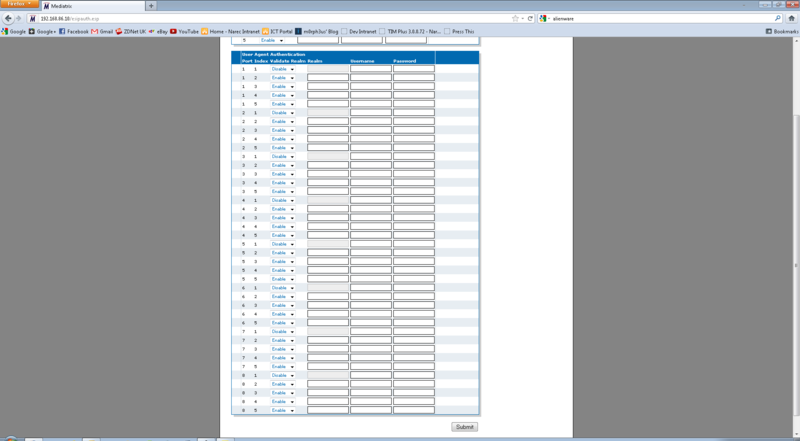 Select the unit from the list and click OK.
Now that you have the IP address of the unit we can start to configure it. Hint: If you cannot find the IP of the unit you can plug an analogue phone into one of the ports and dial *#*0 and the unit will announce it’s IP address over the receiver. This is where the configuration starts to get buggy. We need to perform configuration steps in both the UMN and the web interface of the unit as certain features don’t work in certain interfaces. First of all we will do the configuration in the web interface. Open up your browser and type in the IP of the Unit. 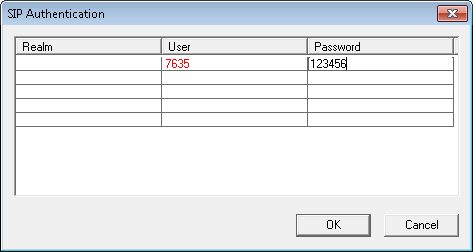 Hint: the default user name is “Admin” and the default password is “1234”. you may want to change these. Once logged in click on the SIP link at the top of the page and then click “Authentication” on the sub menu. For index 1 of each port change the “Validate Realm” option to disabled. Click “Submit” when done. It should look like the screen shot above. Login to your Shoreware Director web interface and create a new user (or modify an existing one). Ensure the option to “Allow use of Soft Phone” is set and select “Soft Phone” for the default phone for the user. Scroll down to the bottom of the page and enter a User name and SIP Password for the user. We have chosen to use the extension number of the user in Director as the user name to make things easier to manage. Save the User. Now go back to UMN and expand your unit from the left hand pane. Right-click the “SIP” object and click Edit. 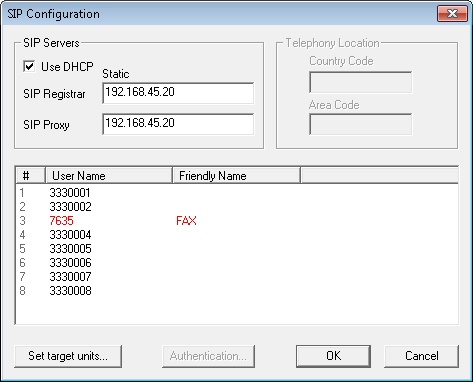 Uncheck the “Use DHCP” option and enter the address of the SIP server to use. This might be the IP of your SG90 or the Shared IP of multiple SG90’s with SIP proxy enabled. Unless you have an advances setup you should enter the same address for both the SIP Registrar and the SIP proxy. Double-click the line where the value in # corresponds to the port you wish to configure. In “User name” enter the SIP user name setup earlier in ShoreWare Director. “Friendly Name” can be set to anything that will help identify the device that is connected. While the line is highlighted click on the Authentication button. In the user column enter the same value as the User name in the previous screen. Password should be set to the password configured earlier in Shoreware Director. Now restart the unit. This can be done by right-clicking the unit in the left hand pane and selecting “Actions > restart (Graceful)”. Once the unit if back up you can check the status of the port you have just configured by single left-clicking the SIP object from the left hand pane. In the right hand pane it will display “Registered” next to the port that you have just configured. Hint: This took roughly five minutes on our system before the port will register. Once registered it is instant the next time the unit is restarted. Just remember that you cannot disable realm validation from the UMN and for some reason the unit will not register ports that were configured in the web interface. Hopefully this will be fixed with the next software update.